Even hardwood has the ability to hold dirt and grime. Our deep-cleaning process gets the dirt and grime out of the hardwood floor surface and joints without damaging the finish. 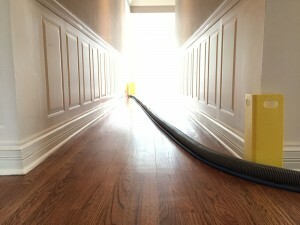 We’ll handle all your hardwood floor cleaning. This is one of the most important part of the cleaning process. Pre-vacuum all surfaces to be cleaned using commercial-grade canister vacuums equipped with HEPA filters. After vacuuming we will pre-clean the floor using a slightly damp microfiber mop to remove any further dust that is not picked up by the vacuum. Using a machine specifically designed for hardwood surface cleaning (and cleaning agents to match) we deep clean dirt and sticky residue from the floor surface and joints. A small amount of cleaning solution is applied to the floor surface with a soft bristle brush and is then vacuumed up immediately. The cleaning agent used has a high alcohol volume which promotes extremely rapid evaporation, leaving your floor dry and clean – Quickly. Along with the cleaning agent, a rinsing agent is also utilized to ensure all the cleaner is removed from the floor and surface joints. Periodically, a water-based low-VOC polyurethane finish may be applied after the cleaning process. Contact Spectrum, your Aurora hardwood floor cleaners at (630) 898-3200. See what some of our clients have said about our team!